These methods are best for thickening the eyebrow. Eyes are the most important part of the beauty of the face. Their beauty also increases when the eyebrow is dense. With this, your look becomes untraceable even without your look. While light and thin eyebrows show face to face Some girls use eyebrows pencils to show eyebrows, but this is a temporary way. 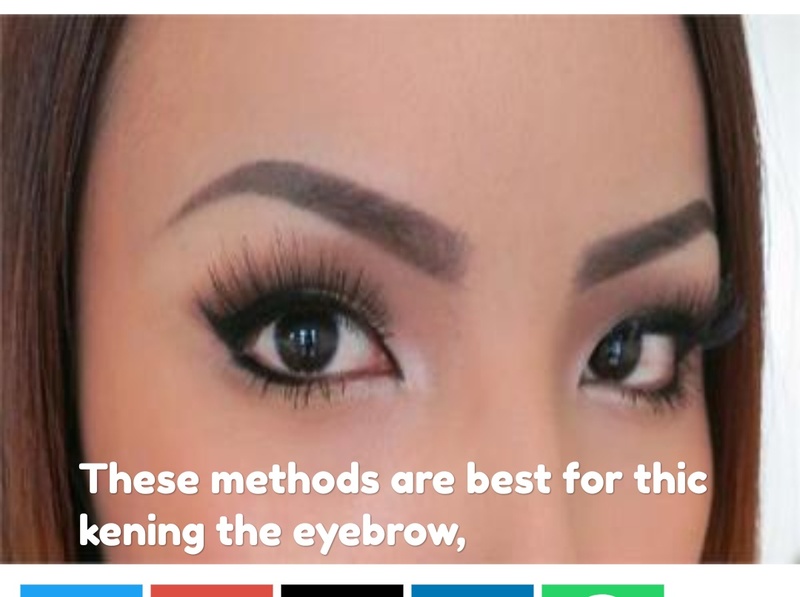 You can make eyebrows even more dense permanently. For this you will be benefitted greatly by adopting some domestic methods. Castor i.e. Arandi's oil is very effective for making eyebrows fast. It starts to grow hair faster. Use of it at night gives more advantage. Put a little castor oil on cotton, put it on the eyebrows. After this, massage the eyebrow slowly with the fingers and wash it with lukewarm water after 30 minutes. Vitamin E, iron and nutrients in coconut oil are very good for the growth of hair. It is also very effective for the animals. Massage the coconut oil by putting some drops on the eyebrows at night. With this, blood circulation is better, which leads to increase in hair growth. Do not keep it like this overnight. Use it for at least one month daily. Vitamin E present in it makes the hair thick and strong. Mix a little honey in olive oil and massage the eyebrow with it for 2 minutes and wash it with water. Also, before sleeping, apply olive oil on the eyebrows and massage for 2 minutes. Onion juice is also effective for increasing hair growth. Remove the onion juice and apply it on the eyebrow and wash it with cold water after 5 minutes. It can also be used twice a week. Fenugreek granules are also used to prevent hair loss. To make the eyebrows thick, take a little fenugreek seeds in the water at night. Grind it in the morning and make a paste and mix it with a drop of coconut oil and mix it. Put this pack on the eyebrows before sleeping at night and wash after 10 minutes. Only use this 2-3 times a week. Milk rich in protein and nutrients also helps to make hair healthier. Put a little milk on cotton, put it on the eyebrows. Clean it with lukewarm water after drying. Cut a small slice of lemon and rub it on the bhoomo for 2 minutes. Keep in mind that massage should be done with light hands. Wash it with lukewarm water afterwards.